My wife Jenna was kind enough to stop at Target on her way home from work this evening, and when I arrived home there was an assortment of 2017 Topps packs to be opened. In what seems as if it's possibly the longest offseason in the history of the world, opening a fresh pack of the new year's baseball cards is pure joy. While this year's flagship design isn't great, I like it better than the 2016 design. The smoky corners are gone and in their place we get a bunch of criss-crossing silver lines and rectangles. I'm grateful (again) for the lack of silver foil on the front of the cards, but I don't like the distorted and smooshed team logos. 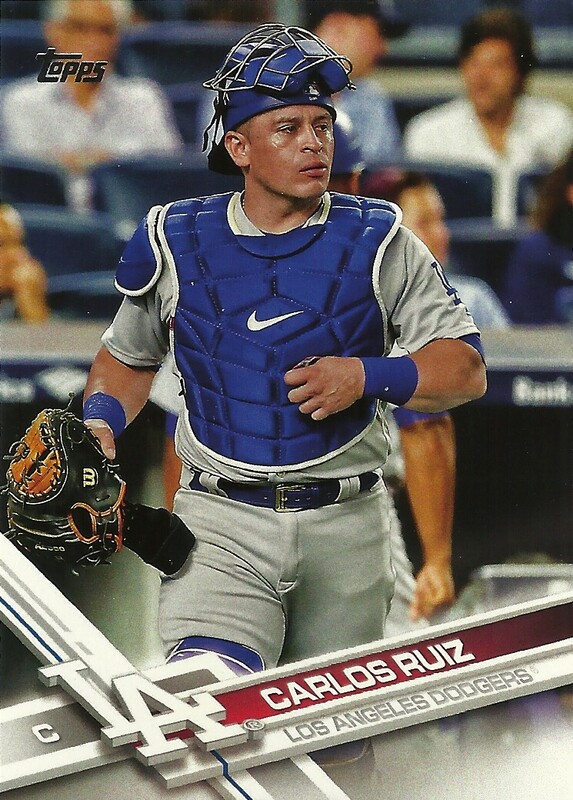 I get that Topps is going for a 3D-ish, futuristic design here but I'm still stuck wishing that every set looked something like the Topps sets from the 1970s. I suppose the kids will like the design and (more importantly for Topps) the cards will work well in multiple colors on their Bunt app. 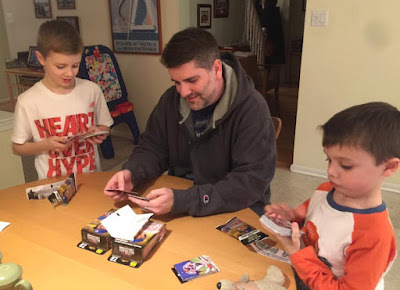 For the record, Doug (10 years old) really likes the cards and Ben (6 years old) just hopes that Ben Revere is included within the set. Full career statistics are gone from the backs of the cards. That doesn't bother me as much as I thought it would and I really like the full-bleed, team color-coded design on the backs. 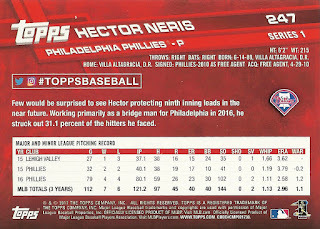 Each player also has his Twitter or Instagram user name featured on the backs or if the player doesn't yet participate in social media there's a generic #TOPPSBASEBALL that appears. 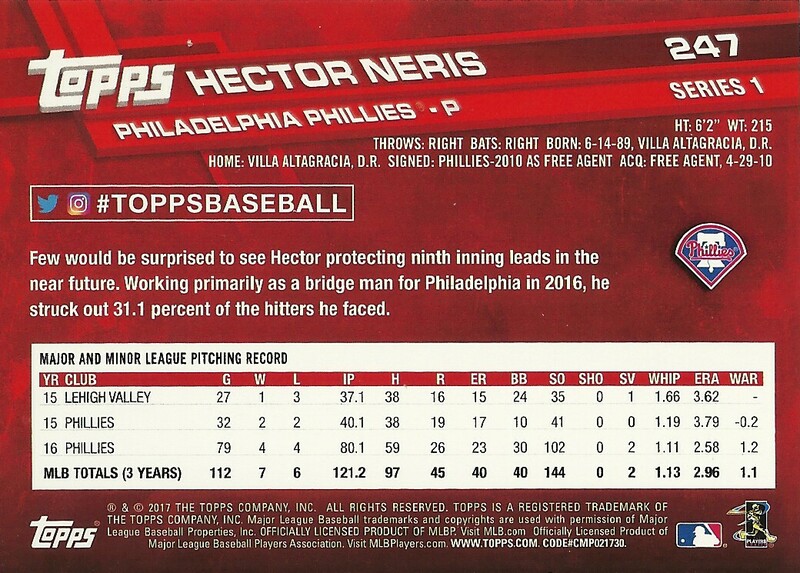 Hector Neris was The First Phillie this year. 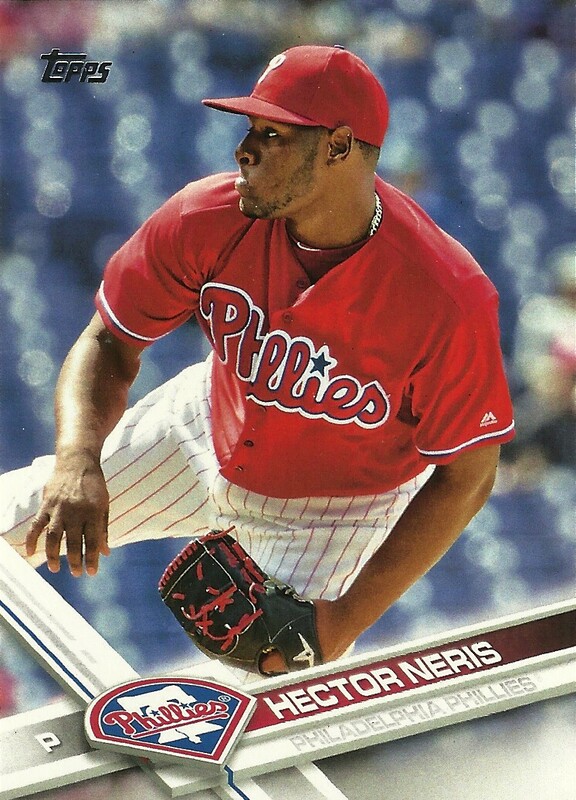 He was in the first pack I opened, and because of his lack of social media accounts he gets the #TOPPSBASEBALL treatment on the back of his card. 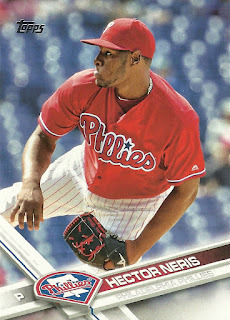 Doug's First (non-official) Phillie card was Howie Kendrick (with the Dodgers) and Ben also pulled a Neris card as his First Phillie. I could complain more about the collation (lots of doubles) or the non-essential inserts, but I won't. 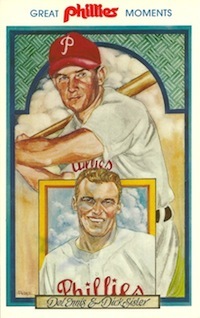 I have new baseball cards to sort tonight and all is right with the world for a little while. So jealous! I can't find a pack anywhere! 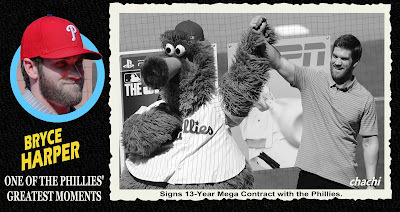 Already setting aside Red Sox parallels/inserts for an eventual 2017 delivery. My local Target must be in a time warp of some sort. Still nothing. Hope my patience pays off with a hot blaster of some sort.